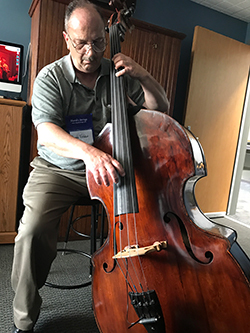 Rochester bassist Danny Vitali connects with the Scott LaFaro bass during the Scott LaFaro Archives exhibition at the 2017 ISB convention. 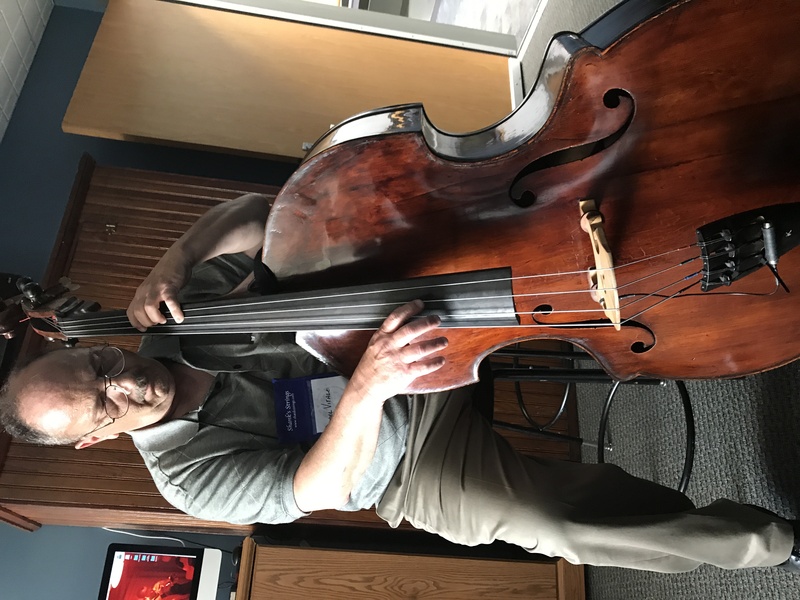 Barrie Kolstein of Kolstein Music chose April 14, 2014, which would have been the Scott LaFaro's 78th birthday, to announce his gift of Scotty's double bass to the International Society of Bassists. Scott LaFaro, best known as the bassist in Bill Evans's groundbreaking trio, remains an influence on players today decades after his untimely death in 1961. The ISB gives the Scott LaFaro Prize to the first place winner in its biennial jazz competition thanks to support from Scott's four sisters and the endowment fund they created for the ISB in memory of their brother. With the gift of the Scott LaFaro Bass, the ISB will make the instrument available for performances by ISB members as part of the Scott LaFaro Archives at Ithaca College in Ithaca, New York, where Scott's father, a violin virtuoso and band leader, attended in the early days of the conservatory and where Scott attended classes for a year. The Scott LaFaro Archives was previewed during the 2017 50th anniversary convention week at Ithaca College. A highlight of the week was Chuck Israels donation to the ISB of Scotty's notebook. Chuck, a world renowned bassist, educator and composer/arranger, was Scott's successor in the Bill Evans Trio. Both a digital copy of the notebook and the notebook itself will be part of the Scott LaFaro Archives. Throughout the convention week, the LaFaro Archives held an exhibition featuring an iMac computer with searchable images of photos, letters and more. The LaFaro Prescott bass was also part of the exhibition along with Barrie Kolstein's LaFaro Bass Copy #8, and a piano for impromptu fun and celebration of Scotty's spirit and legacy. Sam Shuhan, the official presenter of the archives exhibition at the convention, is working closely with Scotty's sister and biographer Helene LaFaro-Fernandez to digitize photos, letters, memorabilia, and some of the recordings Helene has curated over the last 60 years. Says Sam: "It has been an invaluable experience for me to get to know Helene and her husband Manolo, whose compassion and unconditional love for each other and their family cannot be weighed in words. As we dug through boxes and piles of items, and Helene shared stories about Scott in his youth and recounted his life on the road to success, I realized that her compassion for family began as a young child growing up with her parents, sisters, and most notably, her brother Scott. When we began the project of compiling the Archives, I knew who Scott LaFaro was, and knew about his impact on bass playing, and the short period of time he worked as a professional musician, but I didn't know who he was. Helene's stories, and the contents of those boxes helped me begin to understand the purpose and intention behind this archive: not only to display a revolutionary artist, but also to show what an amazing human being Scott was. We hoped to preserve that idea in this archive, and hope that ISB members and other non-bassist scholars will benefit from the opportunity to come into contact with Scott LaFaro's spirit through these materials." Members of the ISB in good standing may apply to borrow the Scott LaFaro Bass for their own concerts and recording sessions. Click here for more information. The Scott LaFaro Bass is available to members on a limited basis for performances and recordings. For more information contact the ISB Office.